They mightn't have been the first names that spring to mind when it comes to those questions about people you'd make interesting dinner party guests but anyone who's seen Jerry Leiber (25 April 1933 – 22 August 2011) and his songwriter Mike Stoller on one of those birth of rock or popular music since World War Two documentaries would know they'd have made a pretty good double act as dinner party raconteurs. They weren't that shabby in the songwriting department either, but now that Jerry Leiber has left us it'd be down to Mike Stoller to recount single-handed the story about his holiday in Europe, paid for from the songwriting royalties from a song called Black Denim Trousers and Motorcycle Boots, covered as L'Homme à la Moto by Edith Piaf and another number called Bazoom (I Need Your Lovin') by The Cheers. Stoller travelled with his first wife, met Edith Piaf while they were over there and returned to New York on the Andrea Doria, the liner that collided with the east-bound MS Stockholm off the fog bound coast of Nantucket, Massachusetts. After the collision, with the ship listing heavily to starboard, half the lifeboats were useless, but the design of the ship allowed it to stay afloat for eleven hours, long enough to rescue 1,660 passengers and crew. Forty-six passengers were killed in the collision, but with the survivors being ferried into New York it would come as no surprise to find concerned family members and friends at the disembarkation point to greet the survivors. Leiber met Stoller with a dry suit and the news that they'd just scored a Number one hit with Hound Dog. The response from Stoller went something like What? Big Mama Thornton got to Number One? No, Leiber replied. Some kid called Elvis Presley. Given the extent and quality of their writing catalogue and their production work for Atlantic and their own Red Bird Records they'd undoubtedly have had a wealth of tales about The Coasters The Drifters, Ben E. King, Phil Spector, Jerry Wexler and Ahmet Ertegun. And then there was their work with Mr Presley, including Jailhouse Rock and King Creole. Born in Baltimore, Leiber met Long Island native Stoller in Los Angeles in 1950. Leiber was a high school senior working part time in a record store while the piano playing Stoller was a college freshman. After his family moved west, Leiber had started writing lyrics, based on what he heard on the radio and his own childhood bacck east, but needed someone to write the music. A drummer friend recommended Stoller, a skilled pianist with a penchant for boogie-woogie, jazz and blues and the rest, as they say, is history. They were capable of coming up with a song in a couple of minutes, and when producer Jean Aberbach and his brother turned up looking for the songs Leiber and Stoller were supposedly writing for the Jailhouse Rock movie, refusing to leave without them, Jerry and Mike knocked out four songs over the next couple of hours, including Jailhouse Rock and (You're So Square) Baby, I Don't Care. They'd been too busy doing the jazz club circuit to get around to the writing any earlier. Their first recorded effort was Real Ugly Woman, recorded by Jimmy Witherspoon and their first success came with Hard Times by Charles Brown in 1952. They also had minor hits with Hound Dog and Kansas City (first recorded as K. C. Loving) before Elvis took Big Mama Thornton's number to the top of the charts. From there, of course, there was their work with The Coasters, theatrical little teenage vignettes like Charlie Brown, Young Blood, Along Came Jones, Poison Ivy (though an ocean of calamine lotion won't be much help in dealing with a social disease), Little Egypt, Searchin' and Yakety Yak. In that fifties environment where black music was crossing over into the pop charts those songs, essentially rhythm and blues tunes with radio-friendly pop lyrics, were major landmarks, and from there they moved into the girl group era, working out of the Brill Building, producing their own material as well as songs churned out by a stable of writers including Doc Pomus and Mort Shuman, Carole King and Gerry Goffin, Barry Mann and Cynthia Weil and influencing Phil Spector along the way. A collaboration with Lester Sill (later the les in the Philles label partnership with Phil Spector) in Spark Records produced Smokey Joe's Cafe and Riot in Cell Block #9 by The Robins before Atlantic bought the label in a deal that brought Leiber and Stoller into the Atlantic stable while still allowing them to work for other labels as, effectively, the first independent record producers. For Atlantic, they morphed The Robins into The Coasters, co-wrote and produced hits for Ben E. King (Stand By Me and Spanish Harlem) and came up with On Broadway (another co-write with Barry Mann and Cynthia Weil), There Goes My Baby and Dance With Me for The Drifters. After Atlantic they produced and wrote records for United Artists including Tell Him by The Exciters and Love Potion #9 for The Clovers before setting up Red Bird Records, which released the Shangri-Las' Leader of the Pack and Chapel of Love by the Dixie Cups. Things went relatively quiet after they sold Red Bird, but the pair continued working in an independent operation, working with artists as diverse as Peggy Lee (Is That All There Is? ), Stealers Wheel (Stuck in the Middle With You), and Elkie Brooks before being inducted into the Songwriters Hall of Fame in 1985 and Rock and Roll Hall of Fame in 1987. There were, as you'd expect, any number of other awards along the way and in 1995 a musical, Smokey Joe's Cafe, based on that song catalogue, enjoyed an extended run on Broadway and the soundtrack album picked up a Grammy in 1996. 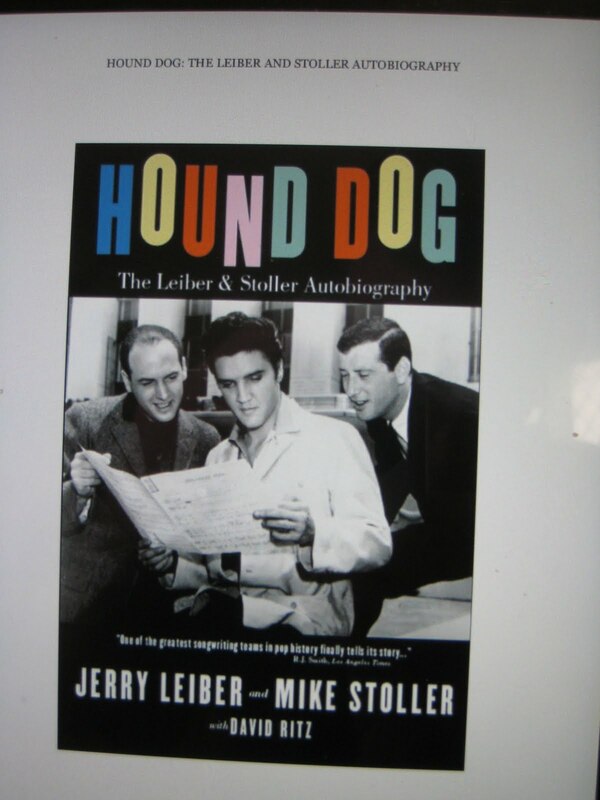 2009's Hound Dog: The Leiber & Stoller Autobiography, written with David Ritz is sitting on the iPad as I type, right at the top of the Read These ASAP list. Son of Jewish immigrants from Poland, Jerry Leiber grew up on the edge of the Baltimore ghetto, where his widowed mother ran a grocery store and was the only shopkeeper in the area who'd extend credit to blacks, picked up his musical inspiration through exposure to black culture during his childhood and teenage years, was responsible, along with partner Mike Stoller for fifteen #1 hits by ten different artists, had songs recorded by, among others, The Beatles, Aretha Franklin, Willie Nelson, Otis Redding, The Rolling Stones, Frank Sinatra, Barbra Streisandand James Taylor and died, surrounded by family, he died of cardiopulmonary failure in a Los Angeles hospital, survived by three children and two grandchildren and generations of music fans on 22 August 2011.